Yes, the Hollywood Theatre is another of Portland’s treasured arthouses. They may play a semi-indie film every once in a while (Win Win and Jane Eyre being recent examples), but this is by and large a place devoted to the small and obscure. Of course, it isn’t all documentaries, amateur films, and foreign movies. The Hollywood Theatre plays host to such events as the Grindhouse Film Festival, the H.P. Lovecraft Film Festival, the Kung Fu Double Feature, the Portland Latin American Film Festival, the Portland Oregon Women’s Film Festival, the Portland International Film Festival, and even a Faux Film Festival. Every so often, the theater will also host sing-alongs. No joke, lyrics are put up on screen as music is played, and everyone in the audience will engage in group karaoke. This has recently been done for ’80s movie themes, ’80s new wave, “ultimate rock,” and Queen. I’ve never been to one personally, so ask me no questions. Last but not least, Hollywood Theatre debuted “Cheap Date” — a monthly showcase of local stand-up comedians — just three days ago. They also debuted “Arcade-O-Vision” on the same night, which is… well, this. More About the Place: This theater resides in the Hollywood District of Portland’s east side. But the theater wasn’t named for the district. No, the district was named for the theater! The Hollywood Theatre first opened on July 17, 1926. It was the last venue in Portland designed for movie screenings and for vaudeville acts. For both applications — because films wouldn’t start talking until 1927! — the theatre had an orchestra pit in front of the screen, with enough space for an eight-piece orchestra and a $40,000 Wurlitzer pipe organ. To put that kind of money in perspective, general admission cost 25 cents (kids got in for a dime) when the theater first opened. Not content to simply make a movie theater, Portland architects Harry Herzog and John V. Bennes (also responsible for Portland’s historic Baghdad Theatre) set out to design a “movie palace.” Seriously, an opening-day advertisement calls it a “palace of luxury, comfort and entertainment unsurpassed by any theatre on the Coast.” The architecture was extremely important to lure in customers: Back then, moviegoers were perfectly happy to sit in rows of chairs and watch a film projected onto the side of a retail storefront. By comparison — though the theater itself is mostly made of poured concrete — the entrance is a piece of Spanish Colonial-themed art, complete with towers and pillars and elaborate figures made of polychrome terra cotta. 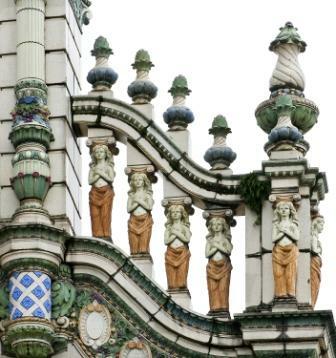 The elaborate polychrome terra cotta figures. The theater originally had a balcony as well, before a 1975 remodeling turned it into an additional two screening rooms. The pipe organ was removed in 1955 and passed through several hands (including the McDonald’s restaurant chain, strangely enough) before being sold to an elderly couple in San Diego. The theater has gone through countless other changes over the years, accommodating such historical cinematic innovations as color, sound and even Cinerama (the first Cinerama theater in the state, ladies and gents). Of course, all that time and reinvention is bound to take its toll. The theater went into steep decline for several years until two things happened. First, it was put on the National Register of Historic Places in 1983. Second, in 1997, Act III Theaters sold the theater to the Oregon Film & Video Foundation (now called Film Action Oregon) for $400,000. Ever since the acquisition, Film Action Oregon has turned the theater into a non-profit business, dedicated to preserving its historical significance and to keeping the projectors rolling. Also in the Area: Sadly, there isn’t much of note here. Aside from the theater — which is easily the oldest and most prominent landmark — everything else in this area is a hodgepodge of apartment buildings, kitschy gift shops, antique stores and the odd restaurant. It doesn’t help that the district was hit hard by the Great Recession, as evidenced by all the businesses that have slashed hours, closed down or moved out. Nevertheless, there are still a few hidden gems around here and I’ve gone to the trouble of finding some for you. Let’s start with one of the more obvious and also my personal favorite. Since TFAW first opened on January 1, 1980, it has expanded into the third-largest comic book seller in the nation, with locations in Portland (just across the street from Hollywood Theatre), Milwaukie, Beaverton, and even a spot in Los Angeles on the Universal Studios Citywalk. Customers can also buy action figures, statuettes, trading cards, models, board games, T-shirts, neon light fixtures and any other kind of merchandise remotely associated with comic book geekery. If Magic cards and/or unusually-shaped dice are more your bag, they’ve got you covered there, too. Full disclosure: TFAW also has a robust online store, which has long been a sponsor of WatchmenComicMovie.Com, where I’ve spent the past few years serving as forum moderator. Not that I’ve ever seen a dime of that sponsorship money, mind you. Also across the street from Hollywood Theatre, you’ll find no less than three watering holes all next door to each other. The two pictured above are a total study in contrast. One is a dive bar, complete with lotto machines and sports on TV, serving a wide variety of cheap (but surprisingly good) food and alcoholic drinks. The other is a more quiet retreat, designed for customers to curl up with a book and a glass of wine. I’m sure you can figure out which is which. This one is my personal choice of the three. Though the food is a bit pricey, this is still a great place to grab some friends, get a drink and shoot pool. Seriously, aside from the bar, this place has nothing but pool tables from wall to wall (and a foosball table on the upper floor). Here’s the Hollywood Library, just past Sam’s Billiards and three blocks from Hollywood Theatre. Though this particular building opened in May of 2002, the Hollywood Library has existed in some form or other since 1917. The library’s most recent home is a 13,000 square foot mixed-use facility, in which 75,000 books share space with 47 apartments and 815 square feet of ground floor retail space. Here’s a hidden gem if ever there was one. It might not look like much from the outside, but the inside is a bona fide two-story mini-mall, made to look like a subway stop. Located just a couple blocks northeast of the theater, this place has a restaurant and bar, a barbershop, a post office, and even a computer repair store. The upper level has a gift shop loaded with clothes, trinkets and candy, and the lower floor is dedicated entirely to one of the largest and tackiest antique stores I’ve ever seen. It’s a very nice one-stop shop and a good place to pass some time. Last but not least is Hollywood Bowl, which features 48 lanes, a restaurant and bar, a gift shop, and a $1 movie rental store. The alley is conveniently located three blocks south of Hollywood Theatre and right next to a MAX station. Personal Memories: I vaguely recall seeing Jean Cocteau’s Beauty and the Beast in this theater, though that might have been at Cinema 21. I definitely remember seeing the director’s cut of Amadeus here, though I don’t know exactly when. The film’s 25th anniversary, I’d imagine. I never really paid any mind to this theater for many years, but it caught my attention in a big way when I came here for the Portland premiere of Ink (you have seen that film by now, right?!). It was a truly magical experience, knowing that such brilliant independent films were being made under the radar and playing right here in this theater. Ever since, I’ve gone back to see quite a few movies, including Mystery Team, Rubber, Hobo With a Shotgun, and Troll Hunter. Not every one of them was good, but they were all memorable experiences. Last but not least, I did attend Hollywood Theater three days ago. I was there to attend the inaugural Arcade-O-Vision, which is set to be a bi-monthly event. Each event will apparently have a different theme, and the first one was “Teenage Mutant Ninja Turtles.” This is where I recently saw the 1990 film on the big screen, just before the whole audience got to play the classic TMNT arcade game on that same big screen. Four-player co-op on free play, shared by total strangers, with an entire audience cheering the players on, just as it was meant to be played. Oh, except that the game’s music was played live by a local band. And they’re doing this every two months, folks. I was there for two and a half hours before going upstairs to catch the first Cheap Date. The comedians were all very funny, and the free Voodoo Doughnuts were just the icing on the… well, you know. Either event would have been an amazing time, but both in one night was just overpowering. Best of all, the tickets were cheap: $6 for Cheap Date and $8 for Arcade-O-Vision. Theaters like this one should be treasured by locals, with or without a passion for films. Not only is there so much history here, and so many great events happening every night, but the theater and those who run it are tirelessly working around the clock to find and promote the best indie films and film festivals that no one’s heard of. Their efforts are so incredible that I’m proud to support them when I can. 67 mySQL queries in 0.272 seconds.